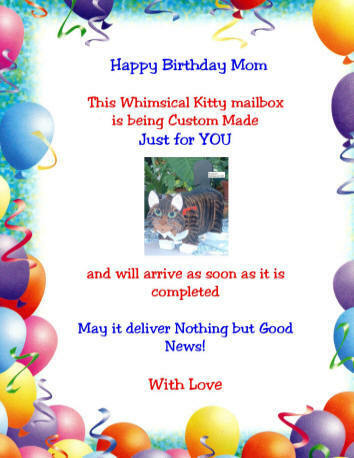 Mailbox Gift Announcements: All our Animal and other Novelty Mailboxes are Hand Made and Hand painted therefore your custom mailbox may take between 3 to 10 weeks for delivery due to the number of orders ahead of yours. We are especially busy during the HOLDAYS! 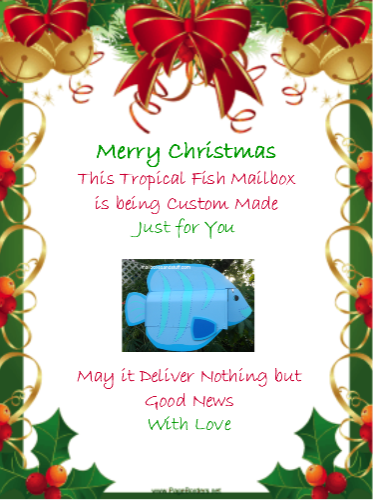 If you wanted to order one of our custom made mailboxes as a GIFT but wanted something to present "right away" you can request a Custom Made Gift Announcement that can be printed out and sent immediately to either you or the recipient via snail mail or attached to an email which you can print out immediately. We use "Special Occasion" beautifully printed stationary which is personalized especially for you and your Gift recipient. We have "Holiday" stationary i.e. : Christmas, Hanukah or Birthday, which is also suitable for Mother's or Father's Day, Bon Voyage or any other "Party" theme. Each Mailbox Gift Announcement will acknowledge the recipient and the particular gift giving occasion and includes a picture of the Mailbox you have ordered. Simply order the item of your choice. At the end of the Order form, you will find a "Special Request" box. Simply type in Gift Announcement Requested... along with the RECIPIENTS NAME or NAMES(if desired) , the OCCASION. If time allows , we can mail it to you or , if prefered , we can email it to you so you can print it out immediately. Your address and the ship to address will already be on your order for me. Be sure to visit our NEW ANIMAL THEME GIFT SHOP for beautiful unique and unusual Giftware for Animal Lovers!